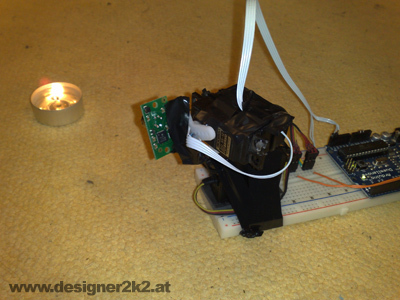 Take the hardware of the 3d Scanner, and just replacing the distance sensor with a thermopile. 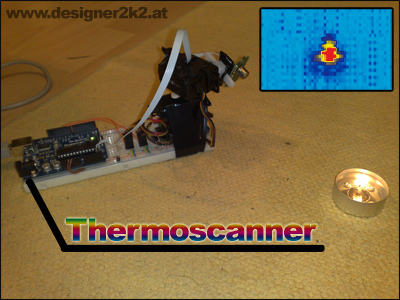 Thats it, and there it goes, the Thermoscanner! Just combine the 2 RC Servos and stick the TPA81 onto it. The TPA81 provides 1x8 Pixels with 5.12° by 6°. The Sensor is mounted verticaly. To Increase the resolution its stepping 1° horizontal and about 2° verticaly. This makes is possible to get a real nice resolution, as can be seen in the top picture showing the candle. The Software is splitted, on part Arduino Code, and the other is Processing. The Arduino is only listening to the Processing Application, and this is then drawing a nice picture from it. This is me on a couch wearing a tshirt and shorts, my face/arms/legs are hotter as they are not covered by clothing. 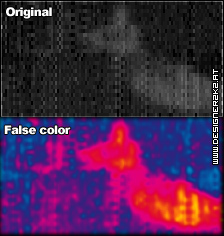 Taking this picture took about 30seconds with the code provided below.